When it's joking about something that really has absolutely no element of humour about it to be found. That's when. Let me preface this by saying that I do in fact have a sense of humour. A rather ridiculous, sometimes off, sense of humour. I can see the funny side of most things, and I generally try not to take a lot of the crap you see on Facebook or other places too seriously. But for some reason, this really rubbed me the wrong way. I thought maybe I was just reading it when I was in a bad mood. But then I saw it again and still had the same thought... This isn't something that should be joked about ever, let alone two days before Christmas. Be careful with all of the the holiday parties going on! I would like to share a personal experience with all of you about drinking and driving. As you well know, some have been known to have had brushes with the authorities on the way home from an occasional social function over the years. A couple of nights ago, I was out for an evening with friends and had several bottles of beer, a brandy chaser, and a drop of red wine. Knowing full well I may have been slightly over the limit, I did something I've never done before - I took a cab home. Sure enough, I passed a police road block, but since it was a cab, they waved it past. I arrived home safely, without incident, which was a real surprise as I have never driven a cab before and am not sure where I got it or what to do with it now that it's in my garage!! It was a status update. It's meant to be funny. I get that. I get that it's making fun of some of those "serious" status updates that you see people copy and paste around the place. And you might think it is funny and that I'm over-reacting or being over-sensitive. 54 people Liked that status so some people obviously think it's a laugh. But when I read it, you know what my first thought was? Man I hope someone who has lost a loved one to drink driving doesn't read that. Maybe they might laugh at it too. But maybe they won't. It may be graphic but the reality is even worse. Because to me, drink driving is not something to be joked about, or laughed about, or made light of with humour. It's just not. No matter what the original intent might have been. One in four fatal crashes come about as a result of a driver having a blood alcohol concentration OVER the .05 limit. I believe that too many people still think that it's ok to drink and get behind the wheel. 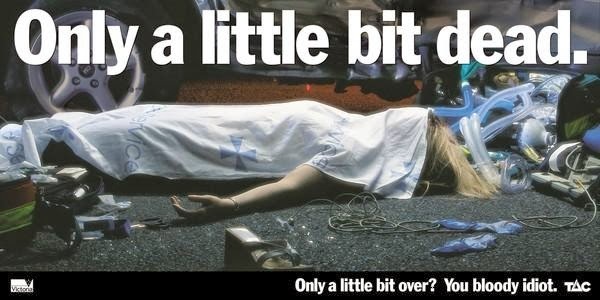 Too many people don't realise just how small an amount of alcohol you need to become impaired. Or worse, kill someone else. Jokes like this take away from the very real consequences of drink driving. The simple fact of the matter is, people have accidents. And over a quarter of those fatal accidents are caused by drink driving. And there is nothing to "Like" about that. What do you think, am I over-reacting? Do I need to lighten up? Or does it sit wrong with you too? Linking up with Jess because it's Tuesday and you know what that means... IBOT! Stuff like this is exactly why I deactivate d my Facebook account on the weekend. I am over it. You are not over reacting, there is nothing 'funny' about drink driving at all. I find it disturbing that people find stories such as this humorous and 'like' or 'share' them on social media. Don't even get me started on the 'neknominations' which are going around at the moment. Some of the stuff that's out there is just sick, some if it needs to be taken with a grain of salt. I think sometimes we are too serious and political correct but other times need to know that what we may see as a 'joke' to someone else could be so much more. I read that update and didn't really think much of it. I tend to just ignore things that don't sit right, maybe I need to get more fired up. 1 in 4 is pretty bad! Good one. These types of jokes piss me too! There's nothing funny about it. I wish our culture would lose this humour about bad guys and deeds. It's about time criminal behaviour was criminal again - instead of funny, cool or worse, intelligent. People really do have a sick sense of humour. They do anything to get a laugh (or a like). They do need someone who has lost someone close to put them in their place. I didn't find it funny but then again I didn't find it overly offensive. Perhaps my sensitivities have been assaulted for so long by the plethora of gross, crude and degrading material floating around the net that the ranting of a mistimed sense of humour just didn't register or upset. That said YOU have every right to be appalled and angry at such material and I respect your opinion. As they say in the classics ... "You can't legislate against bad taste or stupidity"
Were they joking, did they actually take a cab home? It's in quite poor taste but the person who wrote it obviously has never been affected by a drink driver, unlike the rest of us. I've seen this a few times on FB and just rolled my eyes at it. Even without the drink driving reference, it's not really that funny. It's one of those things that may be mildly amusing for the 'Ah, I see what you did there' moment, but I agree that it takes away from the severity of the impact of drink driving. 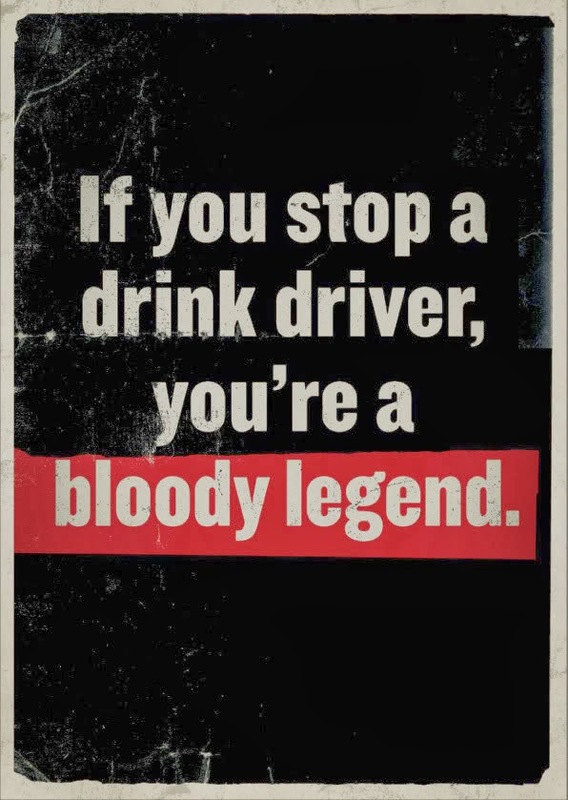 Love the reference to the "Stop a drink driver, Bloody Legend" campaign, the folks over at NZ Transport are doing it right! I'm over FB because of all the rubbish that floods it. I know it was obviously posted as a joke, but a little bit of forward thinking goes a long way. People who have been affected by drink driving see nothing funny in this. Good on you for speaking up about it Kylie. The Legend campaign is surely a way cooler think to Like. Oh dear- not great and I imagine my reaction would be more extreme if I had any direct experience with this issue. Once again, just luck. I will go against the grain here and say it made me laugh. Well, it made me snort. I don't think drink driving is a joke either, but I didn't think this was a joke about drink driving, but rather stealing a cab. But I get cranky about "Jokes" that I don't think are funny either, like people who make fun of others. Channel 10 has 2 comedians doing a show from the Olympics - have you seen it? they made fun of one of our Olympians - a 17 year old downhill skiier, for placing 29th. How is that funny? She's 17 and made it to the Olympics and competed and is 29th in the world?! That's awesome for her! Some people think that joking about serious 'taboo for jokes' subjects because it is funnier because they 'went there!' Idiots. Probably the same sort of idiots that drink drive, one can only hope that if anything untowards should happen its only them that gets hurt and no one else.